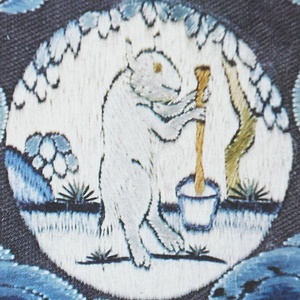 Published: Nov. 11, 2012, 6:19 p.m., Last updated: Nov. 12, 2012, 10:21 a.m.
White rabbit making the Elixir of Life. Source: Wikipedia. For example a randomised placebo-controlled trial published in the Journal of the American Medical Association (JAMA) on 17 October found that a multivitamin supplement modestly but significantly reduced the risk of male physicians over 50 contracting cancer.1 The study was conducted from 1997 to 2011 and included over 14,000 physicians. However, a Cochrane Review published in March considered 78 clinical trials of antioxidants (these include beta-carotene, vitamins A, E, C and selenium, all commonly used in vitamin supplements) that included nearly 300,000 patients.2 The authors wrote that the "current evidence does not support the use of antioxidant supplements in the general population or in patients with various diseases." They also wrote, "Beta-carotene and vitamin E seem to increase mortality, and so may higher doses of vitamin A." To date, large-scale randomized trials testing single or small numbers of higher-dose individual vitamins and minerals for cancer have generally found a lack of effect. There are numerous studies that look at the effects of vitamins on disease. I'm familiar with the research on people with HIV.4 Here vitamin studies have also been inconsistent. The most promising one was published in 2004 by Wafaie Fawzi of Harvard Medical School and his colleagues.3 In this randomised placebo-controlled trial of pregnant women who were not yet receiving antiretroviral treatment, 25% of those who received a supplement containing vitamins B, C and E progressed to AIDS or death. For women taking a placebo it was slightly higher, 30%. The result was statistically significant, but the actual number of women on the trial to whom it made a difference was small. The women on the multivitamin arm also had higher CD4 and CD8 cell counts (immune system cells that HIV destroys) on average than the women on placebo. Despite this positive result, pregnant women in Tanzania are not typical of most people and so the results, besides being underwhelming, should not be generalised to other populations of people with HIV. This was a large study. Over 3,400 patients were randomised, just over 1,700 to each arm. The trial had to be terminated early because patients in the high-dose arm were getting dangerously high levels of an enzyme that works in the liver. This trial result was a setback for proponents of high-dose supplementation. Interestingly, the JAMA study in the same issue that found lower cancer risk in male physicians over 50 was widely reported in the world’s media. I searched news.google.com on 26 October for the words "multivitamin" and "men". The search revealed that many major media outlets including the BBC and the Wall Street Journal ran stories on the positive outcome of the physicians study. By contrast the Tanzanian HIV study was not reported in any major media outlets according to a search for the words "multivitamin" and "HIV". The JAMA can’t be blamed. The Tanzanian study was listed higher on its online contents page (at least when I looked). Whether the decisive factor for the immense coverage of the male physicians study and the muted coverage of the Tanzanian one is due to the positive results of the former, the lack of interest in a vitamin study about HIV-positive Tanzanians or some other factor is conjecture, but it is troubling and does provide some insight into how the media covers medical trials. Last week, the JAMA published another study from the vitamin trial in physicians.6 This time the trial team analysed the effect of multivitamins on reducing cardiovascular disease. There was no benefit. While not ignored like the Tanzanian study, it did not receive anything close to the publicity that the positive cancer result received. Reuters and iafrica.com ran reports on the study according to a search of "multivitamin" and "cardiovascular" on news.google.com, but that's about it as far as the large mainstream media outlets goes. According to the editorial in the latest JAMA, 32% of people in the US used at least one supplement in the 1970s, 42% in 1988 to 1992 and 53% in 2002 to 2006. About one in ten Americans take more than five supplements. These supplements are used more frequently by healthier, affluent and more educated people.7 Unfortunately, I can't find similar statistics for South Africa, but the worldwide vitamin industry is a massive multi-billion dollar one. Regulations governing the approval and marketing of dietary supplements remain less strict than those for prescription or even over-the counter drugs and do not mandate conclusive proof of benefit or safety based on large randomized controlled clinical trials (RCTs). This has allowed for claims of benefit in preventing or curing an amazingly diverse and ever-increasing variety of illnesses ranging from [cardiovascular disease] to cancer, arthritis, infections, macular degeneration, Alzheimer disease, wrinkles, hair loss, decreased libido, and low sexual prowess. The promise of an easy fix for multiple health problems, combined with relatively lenient regulations, fueled the growth of the dietary supplement industry from around $4 billion in 1994 to $23.7 billion in 2008. There are thousands of vitamin studies registered in clinical trial databases. On ClinicalTrials.gov, the US trial registry, there are currently 1,005 ongoing micronutrient trials.8 An enormous amount of time and money is poured into vitamin supplement studies--far too much in my view. Despite this, the evidence that they are beneficial, outside of a few niche uses in some particular populations, is at best equivocal. I often hear claims that multivitamins do no ho harm, thus the choice people make in taking them is one of individual autonomy. USD 24 billion is spent annually in the USA alone - surely if only 10 % of this money was spent annually on infant health in developing countries, life expectancy would increase enormously. Good work, thanks Nathan. I hadn't seen this anywhere - a pity that the media don't pick up on these kid of 'negative' findings. It doesn't fit with the current paradigm (that health foods and vitamins are good for you), so it doesn't get reported. I wonder if we could motivate for a tax on unnecessary waste - a 'stupidity tax' which could be applied to almost all CAMS interventions and potions unless there is proven efficay.